At 9.30 am, on a beautiful sunny morning, 45 members were warmly welcomed by the President Kate Dilks to the annual Birthday Breakfast and Resolution meeting. 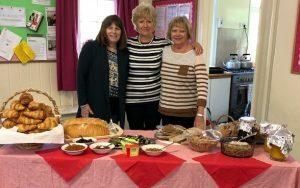 A very good time was had by all, with members enjoying a copious and delicious Continental breakfast consisting of cereals, melon, grapes, juice, bread, cheese, ham, tomatoes, malt bread, croissants & jam. Many thanks to the committee and hostesses who laid out and helped serve the breakfast and the coffee which we had at 11 am after the business part of the meeting. Our breakfast was followed by hearing about this year’s Resolution – ‘Mental Health Matters’ which was ably proposed by Marjorie Mitchell. The Resolution says that Mental health should have parity with physical health in the provision of care. Mental illness can affect all ages and social groups. Many more centres for treatment are urgently needed and it should be made easier to access support and care.The WI will urge the Government to make more money available for such resources to help both patients and their families. Also sadly there is still a stigma attached to mental illness and there is a need to raise public awareness of mental problems suffered by many people. The vote for the resolution was carried unanimously. This decision will go to the National Council meeting which will be held in Cardiff in June. On a lighter note,the meeting ended with a panel game “Call my Bluff” organised by Kate Dilks which gave rise to much fun and laughter.The panel consisted of Margaret Ritchie, Kay Highgate and Patricia Robinson who were very amusing in the way they gave their descriptions of the various words. Members on each table then decided who was telling the truth and gave the result by holding up an ‘M’, ‘P’ or ‘K’ for the name of the person they thought was telling the truth. Remember to click on Poppy Patterns to find the instructions to make the knitted and crochet poppies and see some of the many poppies that members have already made. You have until September to make the poppies, but you can bring them in to any monthly meeting between now and September.